** SELLERS OFFERING $1,000 BONUS TO BUYER'S AGENT *** Bonus negotiable with offer under list price. Town close, with a touch of country!This is one you won't want to miss. Just off Roark Road in Leitchfield you'll find that this 5,040 +/- square foot custom built home makes a HUGE statement! 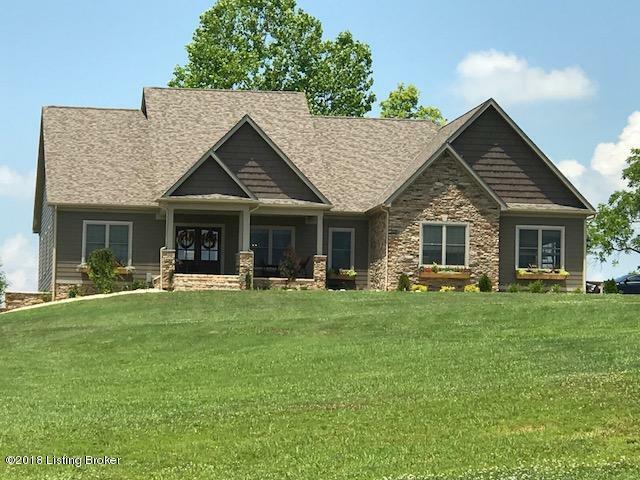 This elevated 5 bedroom/3.5 bath home was constructed in 2014 with the country life in mind with breathtaking views of open fields and the pond located on the 4.35 +/- acre property. You'll never know you're right outside Leitchfield city limits.Enter in through the magnificent double doors into the family room with large arch case opening to kitchen with custom cabinets, granite counter tops, massive island and dining area.The stone fireplace adds a nice touch with a previously used mantle taken from a Louisville home built in the 1700's. Enter in through the magnificent double doors into the family room with oversized furniture and dcor. Downstairs the 2,520 +/- square feet of finished basement looks like a whole other living quarters. With a kitchen/bar area, wrap around island with black granite countertops, large den with fireplace open to game area, bedroom, laundry room with storage, built in gun safe, storm shelter area and full bath it makes a perfect space for entertaining a group of any size OR a man cave.. you choose! This property has too much to list, all the extra features are some you won't want to miss. Listing provided courtesy of Welcome Home Realty Group. © 2019 Metro Search, Inc. All rights reserved.